Lufthansa promotion: Cheap non-stop flights Germany to USA from €271! Cheap flights from Milan or Rome to Colombo, Sri Lanka from €365 return! Cheap flights from Zurich to Jakarta already for €399 roundtrip! German flag carrier Lufthansa, the largest European airline in terms of fleet size (when combined with its subsidiaries) has released some great promotion from Europe. At this moment you can book cheap non-stop flights from main airports in Germany to various destinations in USA. We have selected for you the most attractive or those where you can save the most compared to usual fare. Fly to Boston, New York, Miami, Denver, San Francisco or Los Angeles already for €271! You will find the most interesting deals from Munich or Frankfurt but also adding some optionfrom Dusseldorf, Berlin or Hamburg. If you want to fly on board of classic European carrier. (also one of the five founding members of Star Alliance, the world´s largest airline alliance, formed in 1997)., offering its service to 18 domestic and nearly 200 international destinations in 78 countries across North., Central and South America, Africa, Asia and Europe it is right time to book..Worth to mention that Lufthansa have been awarded as “Best European airline of 2017” by Skytrax. Do miss this excellent Lufthansa promotion and fly from Germany to America on board of first European 5-star airline. (ranked by Skytrax). This latest promotion with Lufthansa (and their partners) is valid for flights departing from Germany between 1st of November 2018 and 27th of June 2019. Based on date of your outbound flight from Europe. Max stay 3 months. To benefit from this great Lufhtansa discount sale you have to book discounted flights by 15th of October. Below please refer to our booking samples to chosen destinations based on direct booking with the airline. Travel dates. : You can easily compare here at Lufthansa website as it vary by each of the European origin as well as chosen destination city. Deutsche Lufthansa AG´s registered office is in Cologne, Germany and main operations base at Frankfurt Airport. Secondary hub is located at Munich Airport. 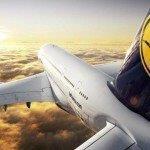 Booking sample of discounted flights during Lufthansa promotion: Cheap non-stop flights Germany to USA from €271! 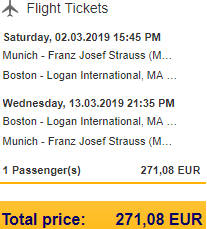 In this case you would depart from Munich to Boston on Saturday, 2nd of March. Your return flight from South East Asia to Europe would be then two weeks later on 13th of March 2019.